In commercial trucking, profits are a precious commodity. With paper-thin margins, it’s crucial that fleets limit wasted time and resources. You need to ensure the most efficient processes and practices to avoid letting your numbers slip from the black to the red. Here are five fleet maintenance management practices that could be hurting your bottom line. Well-maintained vehicles break down less frequently and run more efficiently. Ensuring your assets are up-to-date on their preventive maintenance (PM) needs helps you limit your maintenance spend on more costly unscheduled repairs (including high breakdown-related costs), get better fuel economy, and avoid the fines and downtime associated with failing CSA inspections. You should also customize your PM schedules based on the age of each asset and its unique service and repair history. Treating each asset the same is a recipe for costly breakdowns. Using a Service Relationship Management (SRM) platform helps you achieve the visibility into asset history you need to customize PM. Each extra person you have working on administrative tasks represents tens of thousands of dollars in squandered profits every year. Are your breakdown specialists spending most of their time on the phone? Are you manually entering service and repair (e.g. VMRS data) event information? Are you duplicating data in multiple places to keep everyone in your fleet and service supply chain informed of repair status? If the answer to any of the above questions is “yes,” then you could greatly improve your efficiency and streamline your staff by automating these processes with an SRM platform. In fact, one Florida-based transportation services provider with these issues avoided hiring an extra breakdown specialist and transferred another one to a different department by implementing an SRM platform. To learn more about the dramatic cost savings that fleet achieved, read the case study here. When it comes to capturing warranties, the big gap for most fleets occurs with parts warranty and repeat repairs. Without the right information technologies, your fleet doesn’t have complete back-end visibility to an external repair until 60 to 90 days after the fact when the invoice finally arrives, is paid and is entered into a system of record. In the meantime, your internal shop and several external shops could have worked on the same repair. Plus, many fleets don’t have a good system to track parts warranty in general. All of this adds up to paying for repairs that should have been covered by warranties, wasting your precious profits. Downtime is not simply a cost of doing business. In fact, Days Out of Service are a huge drain on your profits. Each day your assets are down for repair is a day those assets are not generating revenue. Also, it’s a day you may need to pay for rental stock or store safety stock. All of these costs combined with the lost revenue add up to negatively impact your bottom line. Implementing an SRM platform in your fleet maintenance management operations helps you track your Days Out of Service and find opportunities to reduce them. Additionally, the platform helps you communicate effectively with service providers to expedite repairs and limit repair time not attributable to actual wrench time. To truly leverage your business intelligence tools, you need to have the people, processes and technologies in place to capture quality, reliable data. This includes VMRS coding cases and operations, and having the tools to understand service events both in real time and after the fact. With these tools and effective data capture in place, you have the insight to make better decisions that protect your profits. For instance, you may realize that repairing an engine on an asset near its retirement date might not be worth the cost. Or, you could use your data to determine that an asset out for repair should also have PM scheduled. By bundling the PM with the repair, you’re able to limit downtime. 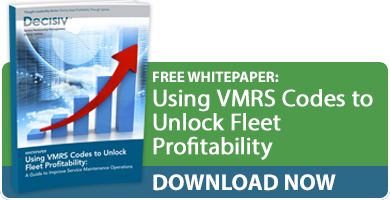 What fleet maintenance management strategies are you using to increase revenue and profit margins? Please share your thoughts by posting a comment below. Gain control of your fleet maintenance management. Schedule a demo of Decisiv’s Service Relationship Management (SRM) platform today.